Parsley juice has an enormous number of health benefits in a small serving. Because the leafy plant provides one of the more potent juices, serving sizes should be limited to about 1 ounce to avoid overdoses or contraindications. Choose parsley with dark green leaves and drink the juice fresh on its own or with carrot, beet or celery juices, but, as with any other herbal remedy, talk to your doctor prior to beginning it. Determining the nutritional value of juice requires a little bit of wiggle room, because the amount of juice obtained from your plants varies. Ten grams of parsley -- about 10 sprigs -- contains 17 percent of your daily vitamin A, 22 percent vitamin C and 4 percent folate. This same amount of parsley also has 1 percent calcium and 4 percent iron, which helps your body absorb calcium. Parsley is an incredible source of vitamin K, which is good for your bones. Ten sprigs contain about 205 percent of your daily vitamin K requirement. According to Dr. Gayle Eversole, parsley juice helps tonify your blood. Its vitamin content strengthens the walls of your capillaries and arterioles, the small vessels that branch from the arteries to the capillaries. Its vitamin K content also affects your blood, because it allows you to make blood clots. Parsley juice serves as a diuretic, which means it aids in your body's processing and removal of liquid. Because many kidney diseases involve water retention, parsley juice can help. Dr. Eversole also advises that parsley juice is helpful for people with gallstones or kidney stones. 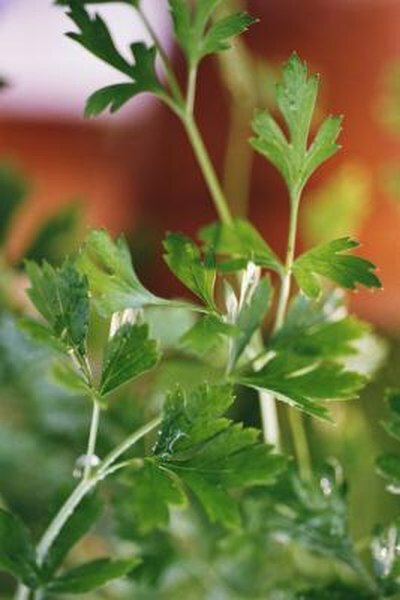 By drinking freshly pressed or squeezed parsley juice, you may be able to pass stones without other medical intervention. Talk to your doctor before trying this alternative remedy. Parsley juice aids your body in dispelling mucus. If you suffer from allergies, chronic sinus infections or come down with a case of bronchitis, parsley juice may help you find relief from sinus pressure and coughing. It can also help ease the discomfort of a common cold. If your symptoms persist or worsen, see your doctor. According to Dr. Eversole, parsley juice helps pass temporary or chronic flatulence. If gas is a problem, drink parsley juice with another juice slowly. Drinking too quickly may exacerbate your gas or the pain associated with it. According to Drugs.com, parsley can have a few side effects. Pregnant women should avoid parsley juice because it is a uterotonic, which causes contractions. Parsley also contains myristicin; this compound is partially responsible for the hallucinatory effects of large amounts of nutmeg. Dr. Eversole recommends limiting parsley juice servings to 1 or 2 ounces a day.